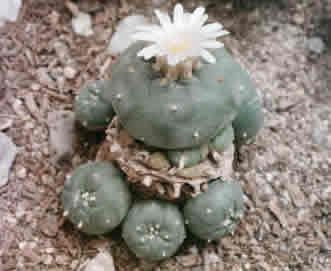 “Although the thornless, ground-hugging Peyote cactus grows naturally only in North Central Mexico and a small part of southwestern Texas, there is archaeological evidence that dried Peyote “buttons” were an item of widespread trade among the American Indians of the Southwestern United States as much as 1,000 years ago. Many mind-altering plants were used by the pre-Colombian Indians for religious purposes, almost universally referred to as “spirit helpers.” European conquerors were not sympathetic to such use of Peyote, however, any more than they were to the sacred mushrooms of the Mazatecs or the oliluquoy (a variety of morning glory seed) of the Aztecs. The cultural gulf between the two world views is still well-illustrated by a single widespread misconception: Americans of European extraction almost universally believe that native shamans or “witch doctors” feed their patients hallucinogenic brews as “medicine.” In fact, the almost-universal practice among Native cultures is for the doctor to ritually consume the consciousness-altering drugs in order to perceive, through revelation, the nature of the patient’s illness. Showing little interest in such distinctions, the conquistadors dismissed the resultant states of consciousness as mere “drunkenness,” called the sacramental use of the plants “witchcraft,” and tried ruthlessly to stamp out the practice. Those sacred or revered plants which were not banned – like tobacco and cocoa – were debased into casual recreations. Although the natural hallucinogen continued to be used – along with such non-chemical methods as fasting and sweat lodges – by holy men in private, by the early years of this century, anthropologists could find only one tribe where Peyote religious rituals seem to have survived intact from pre-conquest times: the Wixarica or “Huichol.” However, in the late 19th century, a new and defiant religion, the Ghost Dance, arose among the last surviving free Indians of the American West. Practitioners danced at night around fires, believing that participation would make the warriors invulnerable to the army’s bullets. It didn’t, and many of the surviving leaders of the Ghost Dance became road chiefs of the less-confrontational Peyote churches which began to organize on the reservations around the turn of the century, attempting to recapture Indian spiritualism in a non-violent form, organizing Peyote use into group ritual, often involving the passing of a bowl of Peyote tea during an all night religious ceremony, similar to the practice of the Huichol. The federal government recognizes the use of Peyote by members of the NAC, but grants this exception to the Drug Abuse Control Act of 1965 – which lists Peyote as a Schedule 1 “narcotic” – only for those who can prove 25 percent Indian blood, putting government in the odd position of allowing selective degrees of religious freedom based on racial bloodlines. Reverend Immanuel Pardeahtan Trujillo, who had joined the NAC in 1948, was central among prominent members of the church who objected to the government’s imposition of this racial exclusivity. Trujillo, son of a French mother and San Carlos Apache father, was raised by an adoptive family in New Jersey. Although Trujillo himself is 50 percent Indian, his children are only of 25 percent Indian blood. He testified in court in a Dallas Federal court in 1982 that he feared his grandchildren could “be barred from the church and from partaking of the sacrament” despite his teachings. Thus, Trujillo became a founding member of the “all-race group” within the NAC, consisting mostly of Korean veterans, in the mid-1960s. But the church quickly responded to political pressure and revoked the charter of the all-race group. Trujillo left the NAC in 1966, establishing a church that would eventually evolve into the Peyote Way Church of God. Trujillo purchased the 160-acre Peaceful Valley Ranch in the isolated Aravaipa Valley in Southeastern Arizona in 1970, on the “backside” of one of the Apaches’ most striking sacred sites, Mount Graham. 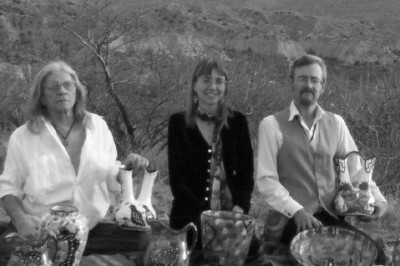 In 1977, the Peyote Way Church of God was founded at the ranch by Trujillo, Right Sister Anne L. Zapf, and Rabbi Matthew S. Kent, for the specific purpose of “stewarding, ingesting, distributing and growing the Holy Sacrament Peyote as the essential and inseparable part” of the members’ religious beliefs.